Have you ever seen a palace made of corn? The Corn Palace has been steeped in agricultural tradition since 1892. So when the caretakers of one of South Dakota's most popular tourist attractions decided it was due for some maintenance, they also decided to gently nudge it into the 21st century. Gone are the fiberglass green-and-yellow onion domes. They have been replaced by airy steel versions. A new marquee, larger corn murals and a walkout balcony have been added outside. And perhaps the most modern touch of the $4 million renovation is that the palace's night face now features LED lighting. It appears dramatically across the building. "It needed a facelift," said Katie Knutson. She is the director of the Mitchell Convention and Visitors Bureau. "It needed something to draw a different crowd." The Corn Palace, which also features an arena to host concerts and high school and college basketball games, draws hundreds of thousands of visitors each year. Knutson and others are hoping the new look will attract a new generation of tourists. And bring back previous visitors. They might be interested in seeing what's changed. The redesign hasn't pleased everyone in Mitchell. It is a town of about 15,000. Catina Kost is a Mitchell native who owns a consignment shop on Main Street. She said some people think the "Las-Vegasy" look is too much of a change. Some of the negativity may have come from the months-long delay between the old domes' removal and the new domes going into place, she said. "There are so many people dissing it and being disrespectful about it when you read about it online," said Kost. Still, she said she likes it. "I just try to be supportive. It's our monument in town." The first Corn Palace was built in 1892. It was where settlers could display the fruits of their harvest. Almost every year since, artists have created colorful new murals on the outside walls. They use corn of different varieties and color. It's a fall tradition that costs about $150,000 a year. The building's annual makeover begins each May. That is when crews start tearing down the rye and sour dock that surround the murals. Workers dismantle the previous year's corn murals in late August or early September. Local artist Cherie Ramsdell then creates paintings to be enlarged and projected onto full-size black tar paper. That is so her designs can be outlined in a "corn-by-numbers" pattern. A crew of decorators follows her directions on where to nail each half-split cob. 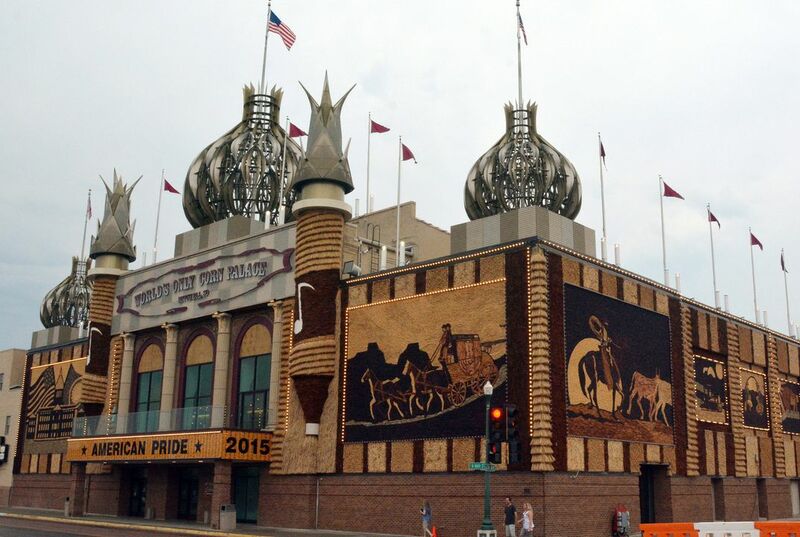 Diane Bollinger recently visited the Corn Palace for the first-time. She raved about it as she posed for a picture alongside her husband, Allen, and daughter, Lauren. The Bollingers were making a cross-country road trip to Seattle. They live in Charlotte, North Carolina. Their first planned South Dakota stop had been the Badlands. But repeated texts from a friend back home convinced the trio to pull off at the Mitchell exit. "I'm so glad we did," Bollinger said. "Have you ever seen anything like this?" Matt Morrison, who moved to town recently from Sioux Falls to become lead pastor of Fusion Church, acknowledged that he doesn't have the attachment to the Corn Palace that a Mitchell native might have, but he said he likes the updated look. "The options for lighting at night definitely give it an element that it didn't have before that I really like," Morrison said. What gives Bugs Bunny his lasting power? What makes the new look of the Corn Palace seem like Las Vegas? OMG!!!!! I LOVE CORN!!!!!! !SUCH A COOL ARTICLE!!!!! Do you know how to make this face? ( ?° ?? ?°) Cool article by the way!
? *BRRRRRING* ? *BRRRRRRING* H-Hello? God? Is this what you wanted corn to be used for? "Not really"
The corn palace looks worth visiting because the corn palace is literally made out of corn in some parts and this article said that they were visiting the corn palace the first time and they said that it was beautiful. I want to go there. The new LED lighting that was installed and appears dramatically across the building at night gives the Corn Palace a Las Vegas feel to it. Many natives of Mitchell claim they do not like the new Las Vegas style lighting. I find this article very interesting because architects made an ancient corn palace seem if it came straight from Las Vegas. The new look of the Corn Palace makes it look like Las Vegas because it's very fun looking and authentic. Also the new modern domes and LED lighting gives it a bright Las Vegas casino look to it. It might've been even designed after it. The new look of the corn palace makes it seem like Las Vegas because of the new LED lights that were installed make the Corn Palace stand out and makes it look very dramatic. Its compared to Las Vegas because Las Vegas has many dramatic LED light buildings. Another reason of why the Corn Palace looks like Las Vegas is because of the bigger pictures and even an arena for concerts and basketball games. This article is very interesting and unique at the same time. The new Palace looks like Las Vegas because the new LED lights give off a Las vegas look to it. The new look of the Corn Palace may seem like it belongs in Las Vegas due to its extravagant embellishments. 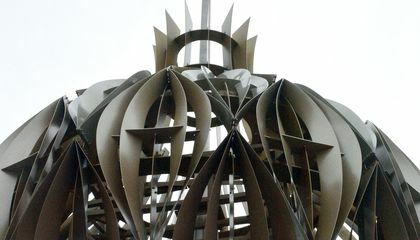 The article states that "the palace's night face now features LED lighting. It appears dramatically across the building." Similar dramatic lighting is seen on many buildings in Las Vegas. In addition, instead of having small corn kernel pictures, there is now a large mural made of entire cobs of corn. It has been completely modernized from what is used to be and has been done so in an over the top Vegas-like manner. I personally think that the new renovations were a great idea to give the town a new look and attract more tourists. South Dakota's most popular tourist attraction, the Corn Palace, is a building that was first built in 1892. It was first used for settlers to display their harvests. Artists also use it to display colorful murals on the outside wall made of different types of corn and colors. The Corn Palace had just been remodeled and now has LED lights inside and new airy steel domes. Some people are hoping that the building will bring new tourists in. I think that it was a good idea to remodel the Corn Palace to make it fit in the 21st century for many reasons. One of my main reasons is because it will bring people to it because it is more modern than before they had remodeled the palace. The new airy steel domes and the fancy and palace like architecture make the Corn Palace seem like a fancy resort from Las Vegas.